You are the singer of the Canadian band Kobra And The Lotus. Could you please introduce the members, describe each of them in two-three words and tell us a bit about the history of the band? 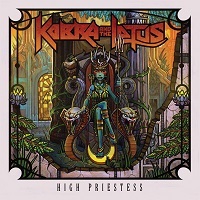 Kobra And The Lotus is a traditional heavy metal/hard rock band that I founded in 2008. My main man, Jasio Kulakowski, has been by my side the longest. He is a lead guitarist that is cogitative, mysterious, and creative. Brad, our bass man, is spirited, motivated, and pure metal viking. Our guest guitarist Jake is eloquent, grounded, and zealous. Our guest drummer Bones is passionate, energized, and super fun!! Your album High Priestess will be re-released here in Germany on November 21st, 2014. How were/are the reactions, from the press and your fans? Are you content with the feedback you got until now? We have been very blessed to have great feedback so far. It seems High Priestess has had a warmer welcome then we could have imagined!! We really hope Germany welcomes it too! It's an impressive CD, congratulation! Did you write the music and the lyrics alone or together with band colleagues? How would you describe your music in your own words? Thank you very much! On this album I have written by myself as well as collaborated musically with several different guitarists and song writers including Jasio and our producer Johnny K. I love to find new guitarists and bring their sound into the fold. Could you please tell our readers: what are the songs about, what are the most important inspirations for you when you are writing songs? The songs are inspired by many different things that I have felt or seen and want to draw attention to/share a message about. This album is about vision, purpose and focusing on what is important in life to give us our best future. The song High Priestess, for instance, is about our journey to finding our inner truth, choosing our own destiny and working towards it for only we are the ones capable of that. Other songs such as Soldier remind us of the sacrifices that have been made by people every day since the beginning of time to give us our freedom in life and how we must never forget or take it for granted. The best thing we can do is to carry forward that benevolence. You released a very interesting video for Soldier – wild, hard, but emotional too. Where did you shoot your parts and the ones of the soldiers? This video was awesome to shoot!! We did it inside an old copper mine in the heart of the Canadian Rocky Mountains. It was freezing cold but authentic and eery… like a real life video game level. Is it easier to start work on the next album after positive reactions or do you feel some kind of pressure, to be even better with the next CD? It is great to receive such positive feedback but it definitely comes with a huge added pressure to create something just as pleasing, if not more, for our fans next time around!! Do we have a chance to find Germany listed in your tour-schedule sometime, too? You will perform with the Metal All Stars at German stages very soon. Twelve men and you are the only woman in the line-up, right? Could you please tell us a little bit about this event and the great involved musicians/singer? This is a very cool, once in a life time event. Yes I’m the only woman but I’m very honoured to be joining such a team of great musicians. On this stage we will unite members of Megadeth, Ozzy, Queensryche, Dream Theater, Venom, Anthrax, Testament, and many more!! Did you choose your songs for this show by yourself? Do you sing duets with your male colleagues, too? I did not get to choose the songs for this show however I’m honoured to be representing the musicians that surround me and their songs. If I had a choice I would have sang Stargazer by Rainbow and 50 Shades Of Evil by Kobra And The Lotus!! Your voice is really awesome. When did you start your career as professional singer? Those are very kind words, thank you. I began singing classically when I was 8 years old and doing national competitions by age 10 but these weren’t for me anymore once I saw Judas Priest at age 15! I began my career as a professional singer by age 22. Which bands/musicians/singers would you name as your greatest influences? Led Zeppelin was the first band I ever fell in love with. I’m also influenced by: Jeff Loomis, Devin Townsend, Matt Barlow, and Type O Negative... probably not what you’d expect!! I listen to a lot of music to open my mind. If you would have the free choice to select a duet partner, female or male, across all music styles – which singer would you choose? This is a very tough decision... it would have to be either Ville Valo from HIM, Jay Buchanan from Rival Sons, or Anders Fridén from In Flames. - studio work or live performances? - digital download or physical CD? - physical copy or vinyl! I’d like to just say a huge thanks to you and everyone who has believed in us so far along the way and kept the metal faith strong! We are eternally grateful to you!! Thanks for your time. We wish you and the band all the best and much success!